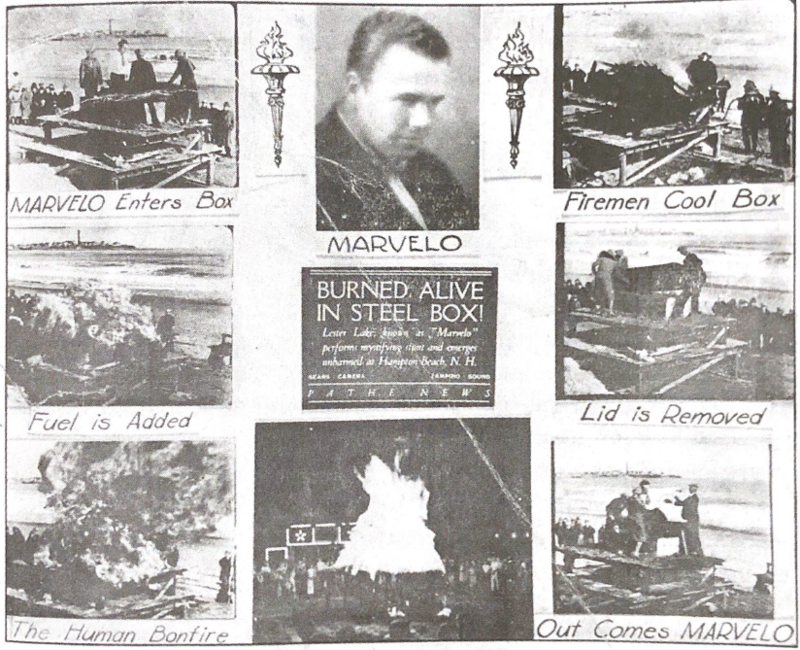 Business stationary, Lester “Marvelo” Lake, courtesy of London the Mentalist, reproduced in Julie Schlesselman’s Buried Alive Every Afternoon Burned Alive Every Evening, p. 123. Lester “Marvelo” Lake was born in 1904 in the small town of New Trenton, Indiana, where his father owned a local dry goods store. It was in that store that Lake met a man who would change his life. 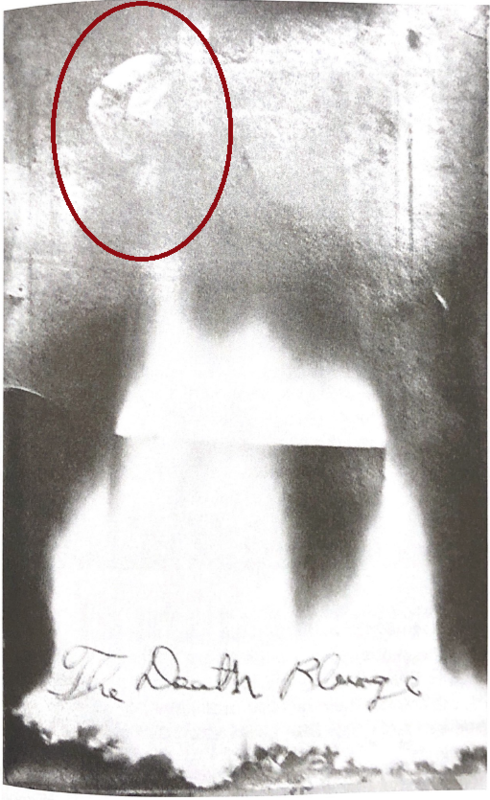 The man remains unnamed in the story told to a reporter, but Lake recalled “Then came . . . an old timer that kindly showed me some tricks and very nicely ruined me forever.” Magic came to be not only a passion for the outgoing and entertaining young Hoosier. It would become his profession. Lake’s magic career spanned from 1925 to 1960. He performed shows in theaters, parks, and nightclubs from California to Louisiana, as well as abroad in Europe and Cuba. The changes in his career reflected closely the changes in the entertainment industry. Early in his career, during the tail end of the “Golden Age of Amusement Parks,” Lake was contracted to perform multiple daily shows at Forest Park in Dayton, Ohio. As the Great Depression set in, Lake began travelling more frequently for work, going wherever he could get a gig – mostly in small theatres and nightclubs. However, Lake’s importance comes not from his performances but from his many inventions. Lake is credited with either inventing or improving upon 300 tricks and illusions during his career. 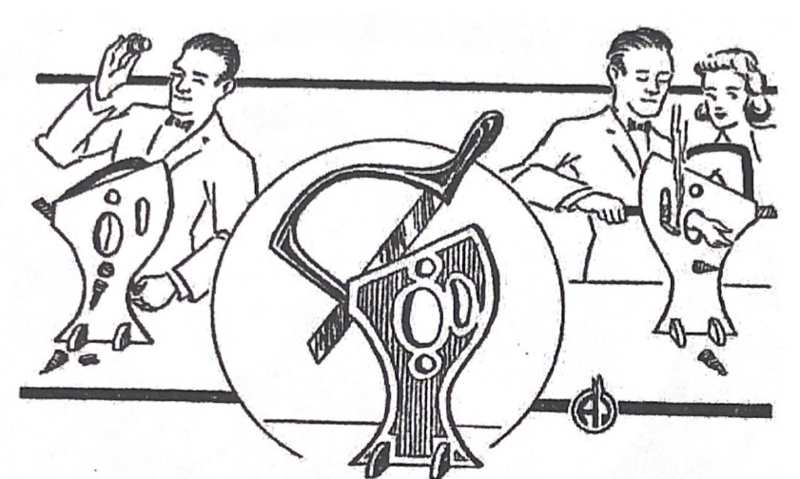 First independently, and later in conjunction with Abbott’s Magic Co. of Colon, Michigan, Lake invented and sold versions of popular illusions such as the Indian rope trick, 3-card monte, and a sword-box. Some of his most notable developments were his spectacular outdoor performance pieces – Boiled Alive and Burned Alive, as well as the Lester Lake Guillotine. Dayton Daily News, August 12, 1928, 22, Newspapers.com. 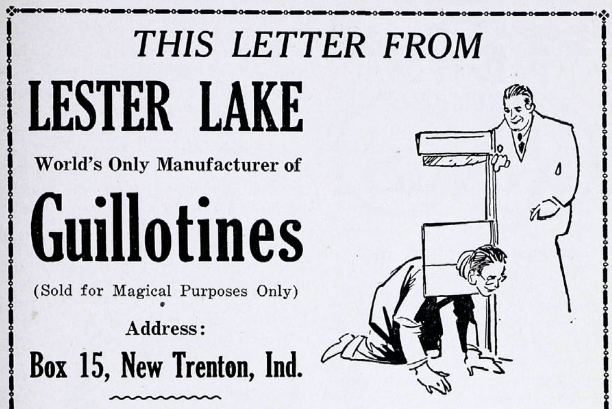 Lake preparing to plunge into the Boiled Alive container, courtesy of Ken Klosterman’s Salon de Magie, reproduced in Schlesselman’s Buried Alive, p. 79. Perhaps due to all of the equipment involved in the production of this illusion, reports of Lake performing it are confined to his time at Forest Park. His next large scale spectacular illusion would become much more wid espread. The Richmond Item, July 5, 1929, 15, Newspapers.com. At Monday night’s performance the oven in which Lake allows himself to be placed became ‘a little too hot.’ He emerged from it as per schedule, but a little too warm under the collar. A fire that is not too hot has been ordered by Lake for future performances. Lake denied all accusations of utilizing an oxygen tank during his performances. 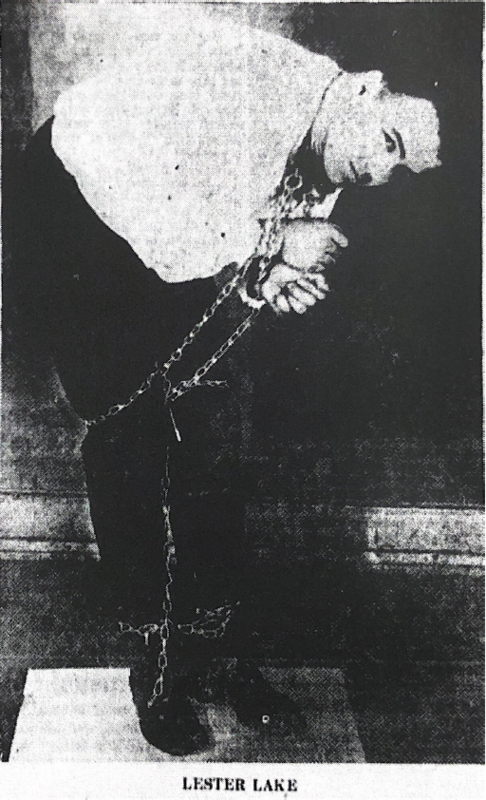 He explained in interviews that he employed “self-hypnosis,” a type of meditation, in both his Burned Alive and Buried Alive Acts. 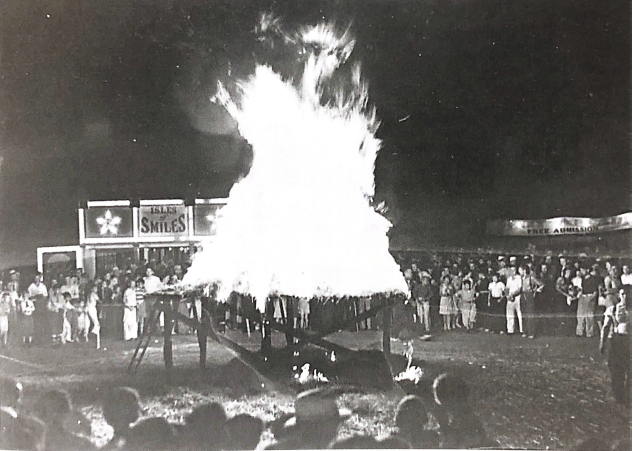 After being closed in the coffin (a wooden coffin was used for Buried Alive and a metal coffin was used for Burned Alive), Lake would enter a “catatonic state,” allowing him to survive on a limited amount of oxygen and withstand the high temperatures. Lake’s Buried Alive Performance, Courtesy of London the Mentalist, Schlesselman’s Buried Alive, p. 131. Advertisement for the Lester Lake Guillotine, personal collection of Julie Schlesselman, reproduced in Schlesselman’s Buried Alive, p. 110. 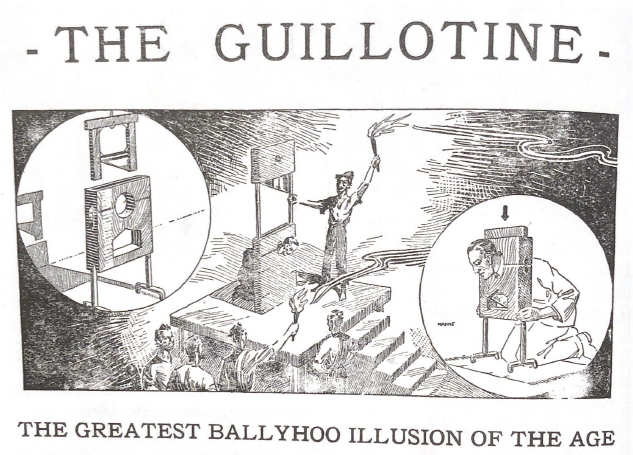 Probably Lake’s most recognizable illusion, the Lester Lake Guillotine, improved upon past beheading illusions. The history of decapitation illusions can be traced back to ancient Egypt. Lake’s version of the ancient trick was different in that it was portable. Weighing about 30 lbs. and transported in a briefcase-like package, the Lester Lake Guillotine was much more feasible for a travelling show and small stage than its large, cumbersome forbearers. The Linking Ring, 10, No. 12 (February 1931): 1557. Lake manufactured his guillotines independently from 1931 until 1934, when he began working in conjunction with Abbott’s Magic Co. From that time on, the device became more frequently referred to as the “Head Chopper.” Later, Lake produced many similar products for the company, including The Chopper (a smaller, even more portable version of the Guillotine) and The Disecto Illusion (shown below). The Conjurors’ Magazine, 1 No. 4 (May 1945): 47.